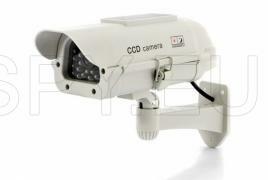 This camera mimics a real one, it has a motion detector that turns it around when something is moving close by. Along with the rotation there is a bright LED included. The camera works with three AA batteries. It is equipped with a solar panel that can charge batteries and thus you can use it indefinitely without having to worry about changing batteries. Dimensions: 210 * 92 * 70 mm. The camera mimics a real one and successfully repels intruders. 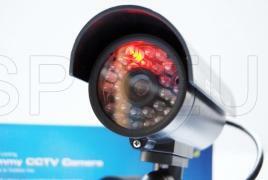 There is a motion detector that triggers the rotation of the camera and the LEDs. Works with three 1.5V AA batteries. Dimensions 150 * 58 * 55 mm. 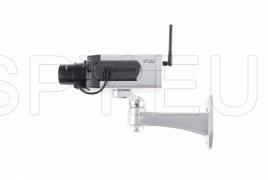 Dummy security camera that is powered by two 1.5V batteries type AAA. This model has a LED diode which every 5 seconds blinks indicating the camera is operational. Fake camera that looks completely like a real dome camera and is designed to chase unwanted visitors away. It has a bright red LED that flashes at regular intervals. 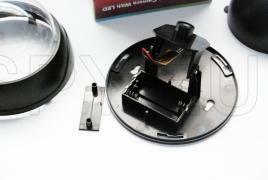 Operates on two AA batteries and comes with an easy installation with screws or double sided tape.